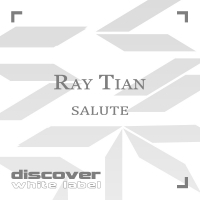 Ray Tian's first release with Discover White Label was the excellent Somersault in 2010 under the name Ray. For his follow up Salute, he has made an equally big record full of acidic squelches, pads and bold lead lines delivering both melody and intensity in equal measures. On remix duty we have The Gebriel Brothers who are rapidly carving a reputation for themselves on the production circuit - something that they prove is more than justified with this quality interpretation of the original. 'Salute' is available now from Beatport and iTunes.